Ellen Prentiss's papa said she was born with saltwater in her veins, so he gave her sailing lessons and taught her how to navigate. As soon as she met a man who loved sailing like she did, she married him. When her husband was given command of a clipper ship custom-made to travel quickly, she knew that they would need every bit of its speed for their maiden voyage: out of New York City, down around the tip of Cape Horn, and into San Francisco, where the Gold Rush was well under way. In a time when few women even accompanied their husbands onboard, Ellen Prentiss navigated their ship to set the world record for speed along that route. 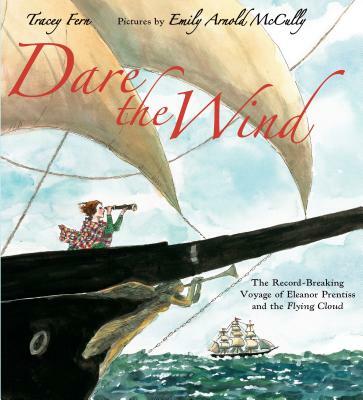 Tracey Fern is the author of the picture books Buffalo Music and Pippo the Fool, both Junior Library Guild selections. She lives with her family in West Newton, Massachusetts, where she’s always on the lookout for unusual rocks. I was born in Galesburg, Illinois, in 1939, but grew up in Garden City, New York. My father was a writer/producer of network radio shows, and my mother had been an actress and singer. Noticing that I was trying to draw people and objects, my mother once said to me, "Why don't you practice that and get it right?" She saw a talent to be developed so that I could support myself when I grew up. As a child, I doodled and sketched and created my own stories, binding them into books. As class artist in school, I designed posters, backdrops, and programs for concerts and plays. I often visited the Museum of Modern Art in New York City and sketched people sitting on benches in Union Square. The city fueled my ambitions for an active life in the arts, theater, and publishing. I attended Pembroke College (now part of Brown University), majoring in art history and acting in plays. I also collaborated on an award-winning musical. For years, people stood around me as I drew, marveling that I could reproduce someone or something. If art was a performance, I wanted to try out other roles. After graduation, I worked as a mat cutter in an advertising agency and earned an M.A. in art history at Columbia University. Realizing I had no future in the advertising agency, I put together a portfolio of drawings and took it around to art directors. Gradually, jobs trickled in, mostly for book covers. Finally, an editor at Harper & Row Junior Books spotted a poster I had done that featured children. I received my first book illustration assignment, which led to another, and so on. Meanwhile, I wrote fiction and published a short story that was selected for the O. Henry Collection. It was followed by two novels. I was able to try acting again when the chance arose to audition for a friend's play. It opened in Albany and moved to Off Broadway in New York. It was a wonderful experience, but I knew I had to go back to books. I have now written or illustrated more than two hundred books for children. My advice for aspiring artists and writers is this: You can't aim to please other people. Do what matters most to you, then hope readers respond. I believe that books, rather than be palliative or merely instructive, should stir the imagination. I share Isaac Bashevis Singer's belief that children's books are the last refuge of storytelling. Emily Arnold McCully divides her time between New York City and upstate New York. She has won many awards for her children's books, including the Caldecott Medal for Mirette on the High Wire.